Previously, on MinerBumping... MinerBumping readers found themselves feeling a profound sense of peace despite reading a surprisingly long series about our enemies. "More subscribers means more money for CCP, which means more cool features for EVE." The Revenue Master is a fallen giant. Once dominant among the anti-Code chatterers, he has retreated to the shadows. His influence can still be felt, however. There are few carebears today who haven't parroted his arguments. They tell us that we need to stop killing people in highsec (especially newbies) because it drives away subscribers. This, in turn, lowers the amount of money CCP makes--putting EVE's future in jeopardy. Of course, most players who make this appeal are entirely insincere. Their response to the slaughter of a blingy freighter: "Leave the new players alone!" As if newbies fly freighters and carry around billions of isk. Besides, the average carebear is too busy worrying about his own isk to think seriously about CCP's profit margins. The Revenue Master is different. He has totally and completely bought into the idea that the quality of his gaming experience is directly linked to the number of EVE subscribers. He's convinced that it would be better to sell EVE's soul and create a mainstream theme park, because then CCP would hire dozens of developers to create new and exciting content for the game. He forgets that the best content in EVE is the content created by its players--something CCP itself has acknowledged. Former CSM Chairman Trebor Daehdoow was the king of the Revenue Masters in their glory days; Ripard Teg (aka Jester) was his chief disciple. They were convinced of their rightness, and they led many astray. The only problem with the Revenue Masters was that they were wrong about everything. CCP's studies (ironically conducted at the Revenue Masters' urging) proved ganking improves player retention rather than hurting it. CCP was incapable of making EVE mainstream by introducing theme park elements, both because EVE is by its nature a niche game and because CCP is incapable of designing an inviting user interface. In any event, CCP was not interested in putting its money into EVE; it diverted EVE subscription revenues to projects like Dust 514, World of Darkness, and VR. As you might recall, I was right about all the things that the Revenue Masters got wrong. The hard-line Revenue Masters tried to keep the faith, arguing that CCP's studies didn't show what they showed. 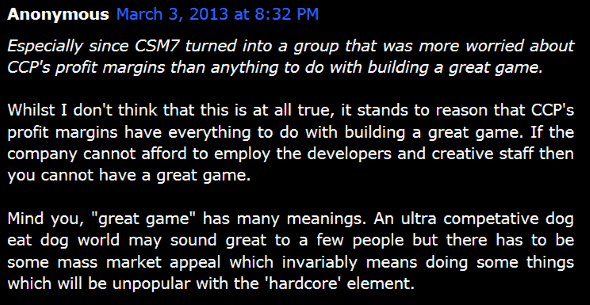 But most of their followers abandoned them when it became clear that CCP saw EVE as its past, not its future. I believe the EVE monument in Iceland is a symbol of this fact: One generally creates monuments to remember people and events that have reached their conclusion. The enemies of the New Order sometimes characterize our Agents and supporters as mindless followers. Nothing could be further from the truth. For the pro-Code individual is someone who has questioned the myths and sacred cows of EVE. The Agent of the New Order is an intellectual; he has read the Code and MinerBumping and has feasted upon their wisdom. He's no follower: He dares to challenge the silence of local, he dares to reject the isk-driven life, and he dares to stand athwart the forces of entropy in highsec. By contrast, the Sheep is an anti-Code fellow whose mind has been set to autopilot. He drifts along through EVE, content to go wherever the current will take him. He hates the Code because everybody else does--or so he thinks. The Sheep is happy to express this opinion because he believes everyone will agree with him. He needn't fear downvotes. The Sheep takes comfort from the presence of others like him. He imagines he has strength in numbers. Besides, questioning the prevailing mood would be too risky, too much effort. The Sheep seeks out that which is already popular, already pre-approved by the masses. Then he can embrace it vigorously, pretending that he's taking a bold stand. The Sheep is the first to celebrate when, for example, someone controversial gets banned. Actually, no, he's the second to celebrate. The Sheep can never be the first to do anything. He must follow someone else. The enemies of the New Order are pleased by the Sheep. They see him as a genuine supporter, and they think he gives them power. However, one must always beware the Sheep. He is not a true believer. When the current shifts in the other direction, he'll be first--ah, the second--to betray you. "This message has been brought to you by fake Veers." Nature abhors a vacuum, and it's rare to find a habitable place that isn't inhabited to some degree. We know it's true in the crowded corridors of highsec; it's also true in the sparsely populated reaches of nullsec. Every system is claimed, formally or informally, by somebody. Then there are those who search for a home in the EVE galaxy and do not find a place that meets their particular needs. They must go on searching in more unconventional locations. It is said that trolls live under bridges, but the Purestrain Troll lives under blog posts, nesting in their comments section. He may inhabit blogs, news sites, forums, and similar ecosystems. The word "inhabit" is chosen advisedly, because he doesn't use a comments section the way others do. An ordinary enemy of the New Order might post insults out of anger, or attempt to spread propaganda. The Purestrain Troll has no such intention. People leave home with an agenda; they return home simply because it is home. Thus, the Purestrain Troll has largely outgrown any hatred he once felt for the Code. His posts are made not to persuade or destroy, but out of habit or for idle amusement. His are the superficial thrills of the imp. He does not yet know the deeper, sublime pleasures of supporting the Code. But perhaps one day he might, now that he has calmed down. Nevertheless, the Purestrain Troll is not entirely at peace, not totally in harmony with his environment. The Purestrain Troll is a territorial creature, which is why no more than a few can occupy the same small space at any given time. He may feel pressure to post the first comment, or at least post early. If his post is routinely buried, then he cannot say the comments section is his home. Having been crowded out, he must move on and find another. Oh yeah, she was great! James is actually providing a great mercy to the rebels by not moderating these comments. Little thanks he receives for it. You might like to compare it with the EVE-O Forums, where the merest hint of a controversial post - or one criticising the hosts - will have you hauled up before the beak, and no quarter given. Were it not for the fact that James can here rely upon our detractors to shoot themselves in the foot every bloody time they appear - thereby entertaining us - I daresay he might intervene upon occasion. But James realises that this is a two-part blog; he supplies one half (the better half, of course), and we the other. Member when Jimmy used to undock? Member Berry Anon, thanks for adding to the content of our blog and raising our traffic. I'm sure you tried it on the hisec milita blog but no one reads that one. Member? Member 'Burn Jita' when it was in Jita? replying to yourself twice in the space of a minute. Member trolling broadcast 4 reps? Member when there where a lot more players in CODE.? Member Ming? Member his walls of text? I member! Member Ming never undocking? Member FIT YOUR CAT? Member? you know what AG should do if they were really committed to their cause? declare permits illegal and gank everyone with a permit in their BIO. then we'd see an interesting power struggle! They're all ganker alts anyway. "His posts are made not to persuade or destroy, but out of habit or for idle amusement." This is not true. Reminding members of Code how horrible their leaders have acted over the years, and in game, in ways that got them banned is the real purpose behind the purestrain troll. Why would anyone want to be a part of a group that acts the way your people do? So in fact, the purpose of the purestrain troll is both, an attempt to persuade people to not follow such a horrific organization that is based at it's very core on trolling, and an attempt to destroy you by reminding you of what horrible shits you really are. There are other play styles in eve, you don't have to be a bully all the time to everyone you know. Trolling trolls. Griefing griefers. I cant think of a better way to do it than in the comment section of your self-affirming blog. And yeah, it's pretty amusing. We get a big laugh at you guys. who is 'we' "Anonymous January 10, 2017 at 3:49 PM" ? As the saying goes miner, small things amuse small minds. If that is your logic does that make you just as bad as them. Im confused and it appears so are you. Wait you get a laugh out of trolling and greifing? you know us. that makes you a nobody!